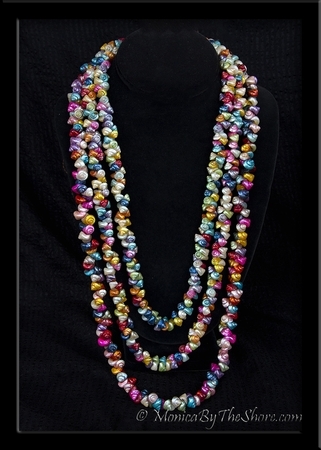 Own a piece of history with this antique multi colored 3 strand Trochus Shell lei necklace. Pre Art Deco design, this vintage shell jewelry set is of the 1940s WW2 era and is in perfect, pristine condition. This is actually two necklaces shown together, one is 30 inches, the other is 50 inches in length to be worn doubled. What a fun, colorful piece of Polynesian jewelry! Shells of every color of the rainbow! Rare antique seashells jewelry designs presented by MonicaByTheShore, with Aloha from Haleiwa North Shore, Oahu.